Mourning doves (Zenaida macroura) are elegant birds seen throughout the United States, Canada, the Caribbean region and Central America. They adjust with ease to new surroundings and are fixtures in many landscapes -- farming sites, urban parks, forests, outskirts of grasslands and the like. Although male and female mourning doves look alike, they're not identical. Mourning doves have short limbs, tiny heads and lengthy tails. Their physiques are usually between 9 and 13 inches long, from the tips of their beaks to the ends of their tails. Male specimens are generally just a tad larger than females, although the difference isn't major. Mourning doves, for the most part, have beige, brownish-gray or light brown plumage. Their wings are adorned with black markings. Their tiny beaks are black, and their legs are reddish. The feathers on their tails feature white edges. Colorwise, male mourning doves are a bit more vivid and intense. The males' breast regions exhibit some pink coloration, and the highest parts of their heads are also somewhat blue. 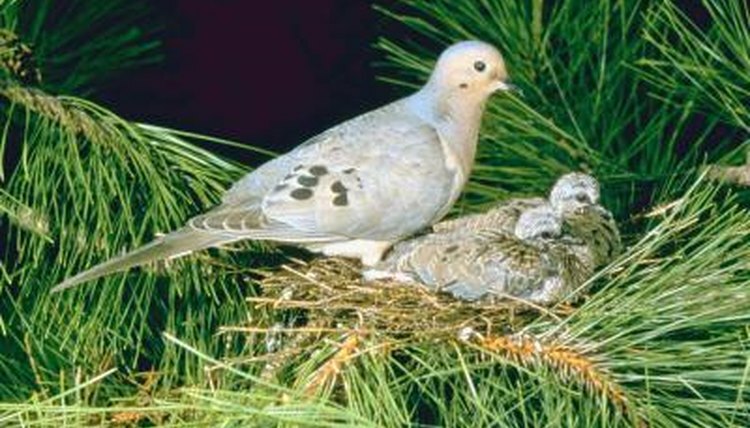 Physical appearance isn't the only way in which to differentiate between male and female mourning doves. Males make big efforts to attract females, notably by lingering on perches and attempting to gain attention through making sweet cooing sounds, which are like smooth and deep cries. These vocalizations draw in female mourning doves. Boy mourning doves carefully guard their preferred perches against any fellow males who are nearby. If you hear murmuring sounds coming from a mourning dove, he's probably a male.